While Western Union and other remittance giants have made strides to build allegiance among immigrant populations, a legion of nimble start-ups are steadily eking into their space – offering reduced rates and convenient, mobile-based services. Facing rising competition and a squeeze on profits, leading money transfer companies are unveiling a range of new mobile money services targeting financially excluded communities. For decades, Western Union has remained the leading player in the global money transfer market, with its trademark yellow-and-black logo found in nearly every region of the world. Controlling an estimated 18 percent of the total money transfer market,with a recorded USD $5.7 billion in revenue generated during 2012, the giant represents a formidable competitor to bright-eyed new entrants. Western Union’s nearest competitor in the money transfer space, MoneyGram International, controls only about 5 percent of the market – though the company’s total revenue increased about 11 percent over the past year. Limited competition in the money transfer sector has historically resulted in steep transaction fees, presenting an obstacle for low-income migrant workers as they send money to families and friends at home. While remittance fees have been gradually decreasing, the average commission was 8.96 percent in the last year, according to the World Bank. Though their steep prices have been unrivaled for years, leading money transfer companies have recently faced increasing pressure from a host of new players, which bill themselves as more affordable, convenient alternatives to industry incumbents. These companies have striven to drive down consumer fees, offer new delivery channels and expand to untapped markets, often by leveraging online or mobile technology. 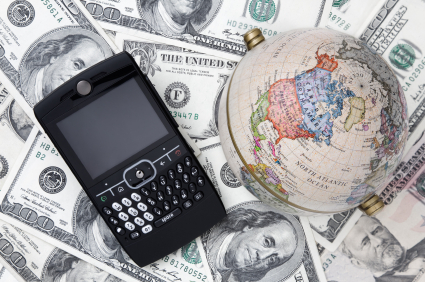 Recent regulatory changes may further increase competition in the global money transfer space. The Dodd-Frank Remittance Transfer Act in the US, for instance, requires money transfer organizations to disclose more information to customers regarding transfer fees and exchange rates. While the legislation itself does not specifically govern remittance prices, it may enhance industry transparency, thus enabling low-income consumers to shop around for the cheapest service. Remittance giants have a lucrative incentive to maintain their edge in the growing money transfer market – which reached USD $534 billion globally in 2012, and is expected to rise eight percent over the next year, according to the World Bank. With the 2.5 billion global unbanked adults comprising a significant portion of remittance senders and recipients, leading money transfer companies have unveiled a range of services targeting the financially excluded. Western Union, for instance, reported last week that its 2013 strategy will focus on strengthening consumer money transfer, and to “continue connecting the cash and digital worlds for its customers.” Western Union’s electronic channels, such as the Western Union website, account-based money transfer and mobile money, experienced revenue growth of 22 percent in the fourth quarter of 2012. This may signal a growing interest in reaching unbanked consumers, many of which lack bank accounts, but have access to mobile devices. While Western Union first began offering mobile money transfer services in 2009, and the ability to send or receive funds via mobile is available in 14 countries, a range of new services have been introduced over the past year. These include a cross-border mobile money service in El Salvador, a mobile money transfer service for MTN customers in Uganda, and a mobile remittance platform for Military Bank customers in Vietnam.Western Union has also become a partner in Financial Inclusion 2020, an initiative which aims to accelerate universal financial access globally. MoneyGram, the second largest player in the remittance market, launched a mobile money transfer service last week in the United States. According to a recent PYMNTS.com article, integrating mobile money is a key part of the MoneyGram strategy to tap into the huge cross-border remittance market. Through the new service, customers will be able to send money, find MoneyGram locations, estimate money transfer fees and view recent account activity, all from their mobile phones. As new entrants shake up the game, and incumbents adjust to the evolving marketplace, the ultimate winner will be the consumer – as prices drop and alternative money transfer channels emerge. Growing regulation around the remittance space will further decentralize the market and enhance the options available for would-be remitters, both banked and unbanked. All stakeholders will thus need to continue refining their services to tap into growing remittance streams, and to reach “mobile-preferred” customers. What Is The Role of Mobile Money In The OTT Debate?